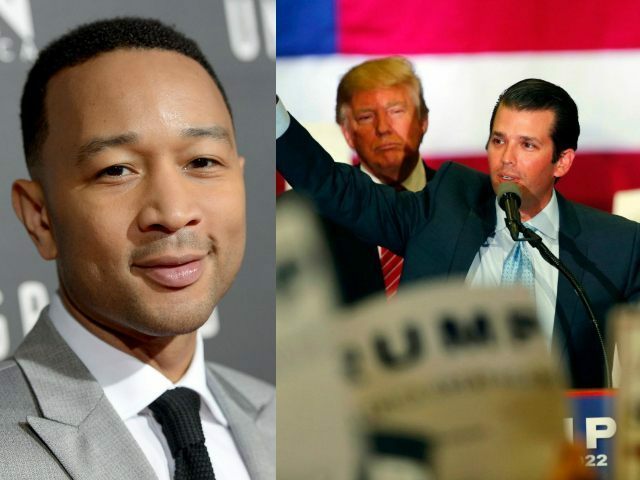 John Legend Calls Donald Trump ‘Racist’ During Twitter Clash with Trump Jr.
R&B singer John Legend described GOP presidential frontrunner Donald Trump as “racist” during a Twitter exchange with Donald Trump Jr. on Friday. Trump Jr., who is an executive vice president at The Trump Organization in addition to being an active campaigner for his father, took to Twitter on Friday evening as swarms of violent leftist protesters shut down a planned Trump event in Chicago. Ha 5 students when asked why they were protesting couldn't even answer. The participation medal/micro aggression generation is pretty sad!
. @DonaldJTrumpJr I think they were protesting your racist father. This isn't complicated. Legend then wrote that he graduated from the same school — the University of Pennsylvania — as both Trump and Trump Jr.
Legend was among a group of at least a dozen influential entertainers who took to social media to blame Trump and his supporters for the violence outside of Friday’s cancelled rally. Many of the anti-Trump protesters later took to Twitter to claim victory for shutting down the event.